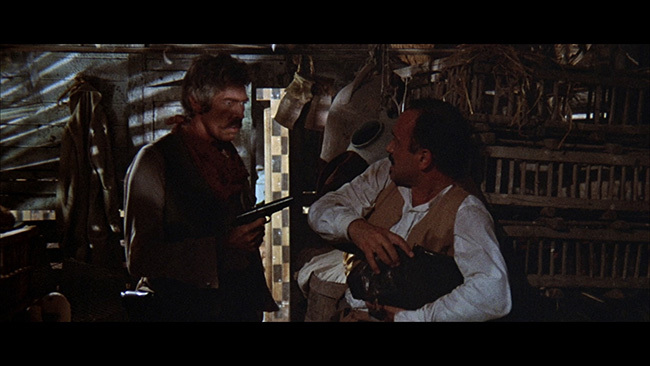 Originally slated to be directed by Peter Bogdonavich and then later by Sam Peckinpah (though it remains debatable if he ever actually considered doing it), Sergio Leone's fifth western is alternately known as Duck You Sucker! 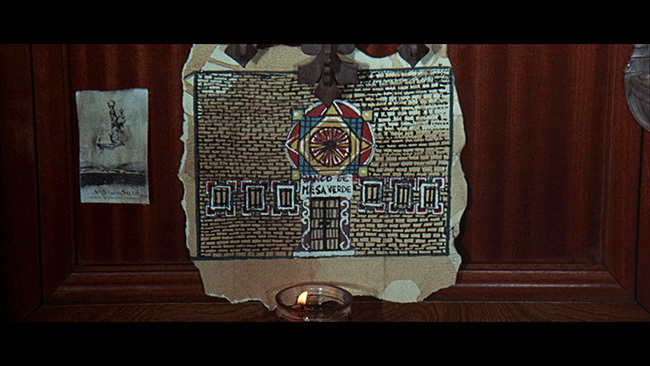 and Once Upon A Time… The Revolution. Though it's not as impressive as his last two films within the genre in terms of storyline, it has an amazing epic scope to it and plenty of the gorgeous visuals fans have come to expect from the director, despite the fact that initially he didn't want to get behind the camera and direct again, he simply wanted to co-write and produce. The plot, at its core, is a simple one. 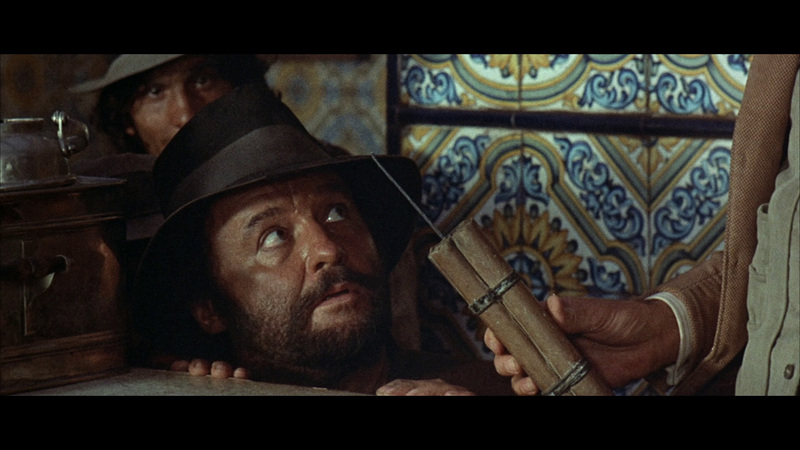 Juan Miranda (Rod Steiger) is a poor Mexican citizen who could care less about anyone aside from himself and his direct family, most of whom are bandits. He has no reason to care about his country or its officials and when revolution breaks out in his homeland, he partakes of the action not out of patriotism or civic duty, but because he thinks it would be exciting, he more or less takes up arms for something to do. Soon Juan meets an IRA (yeah, yeah, the IRA didn't exist in 1903 when the film takes place, but you have to overlook that) terrorist/explosives expert named John Mallory (played by James Coburn) who is hiding out in Mexico from the British forces who are after him. Juan talks John into joining him and his rag-tag crew to help them take down a bank and make off with the loot but John's political roots haven't been completely cut off and he starts thinking that maybe the revolutionaries have got the right idea, at least in terms of their political views. They form a strange partnership, each one with a different agenda, but they'll soon find out that things are not as they seem and everything each one of them believes will be called into question. 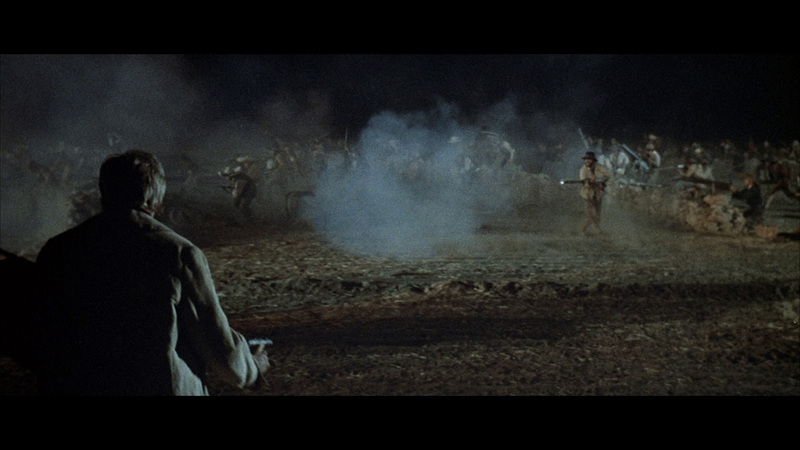 A Fistful Of Dynamite puts the Mexican revolution in a noticeably less glorious context than a lot of the other Spaghetti Westerns that had come before it did. It doesn't try to portray the events as the celebrated activities of freedom fighters overthrowing a corrupt government and instead allows the human nature (or, flaws) of its participants to show throw. 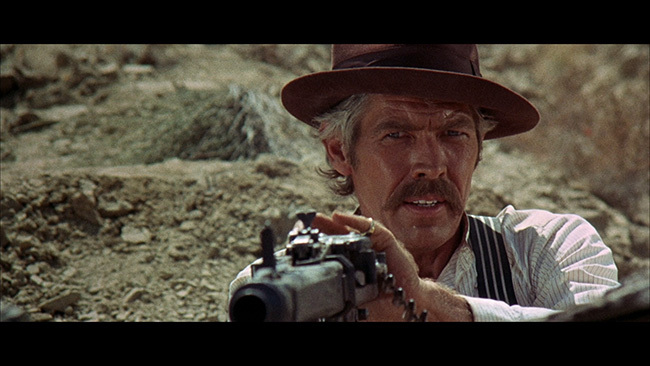 This makes for an interesting film that allows for stronger character development than Leone was able to pull off in his earlier westerns. Coburn does a pretty good job as the Irish activist, and his character makes for an interesting juxtaposition against Steiger's more over the top bandito type. Both actors are capable of great performances and that's exactly what they deliver in this film, playing off of one another's strengths throughout the film. 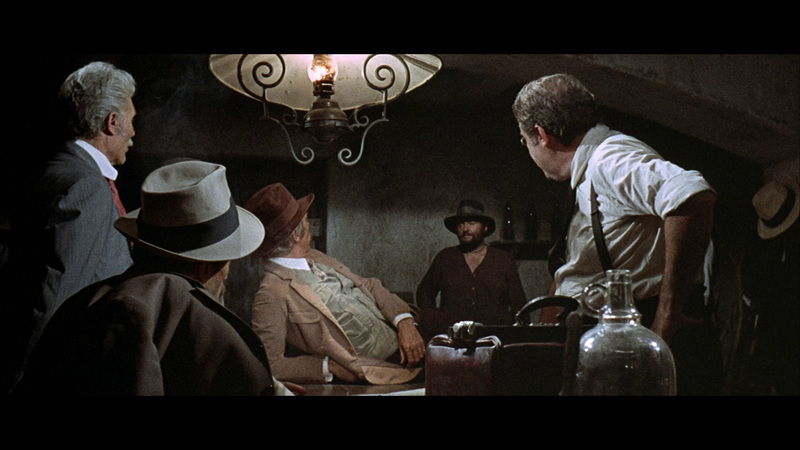 One could easily make parallels between Coburn's character and Eastwood's character in The Good, The Bad, And The Ugly, as well as Steiger's character and Wallach's character in the same film but here they're not so much larger than life than they are based in the harsh reality of their surroundings. 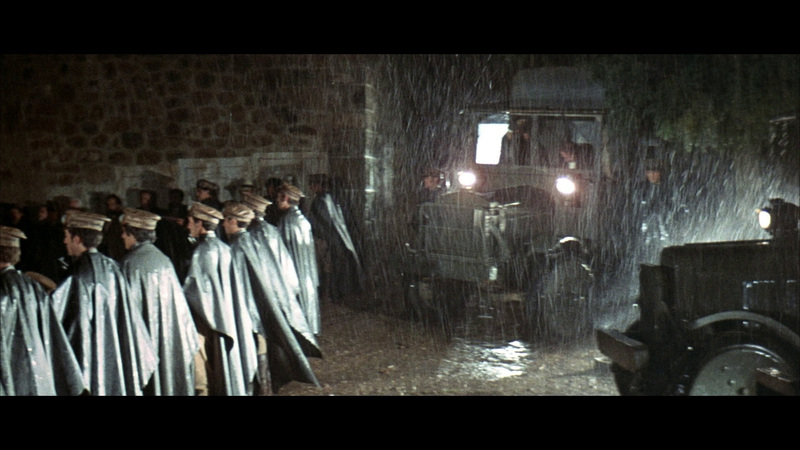 While Steiger's character is explored through the present-day events in the film, Coburn's character is, in grand Leone tradition, developed through a series of extremely well-handled flashback sequences. The more we learn about him, the more we're able to sympathize with him and the more we want him to come out on top when it's all over and done with even though he has made more than his fair share of mistakes in his day. The action scenes are absolutely amazing in their scope and in their execution. At times breath taking and exciting and other times literally gut wrenching in their portrayal of violence, they're completely memorable and stand as some of the director's finest moments in a filmography filled with fine moments. It all leads up to a very emotional finale that suits the tone of the movie and Leone's rather bleak view of the American west quite appropriately. Morricone's typically brilliant score once again works wonderfully within Leone's film and it fits the movie seamlessly. 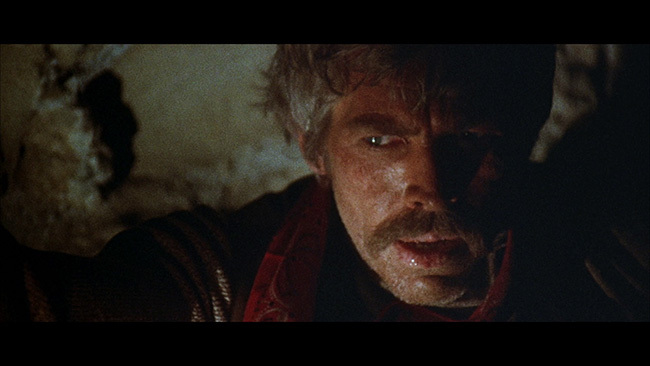 A Fistful Of Dynamite arrives on a 50GB Blu-ray disc framed in its original 2.35.1 widescreen aspect ratio presented in AVC encoded 1080p high definition. Overall the transfer looks okay, but not amazing. 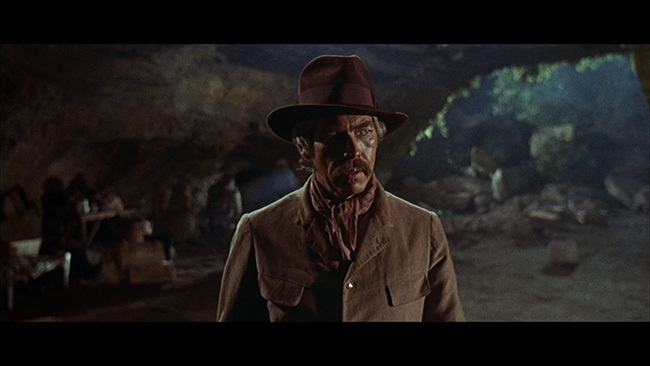 Colors are a little flat in spots (they seem to match the old MGM DVD release, though here we get the A Fistful Of Dynamite title), leaning to green/blue in spots, but black levels are fine. 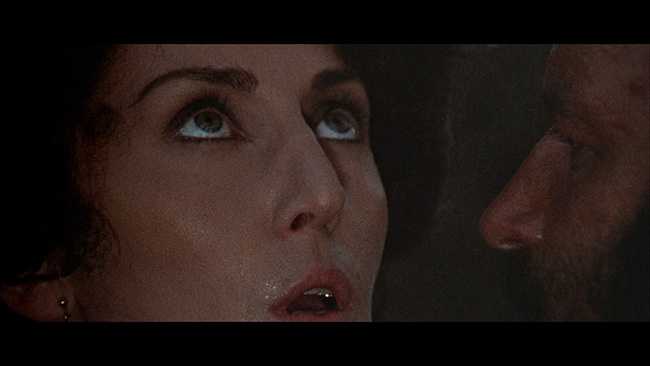 Close up shots show off strong detail, medium and long-distance shots less so but still offer much more to take in than past DVD editions have. Skin tones look fine and the image is pretty clean, showing only minor print damage here and there. This never hits the heights that Blu-ray can offer in 2018, but it looks good and does provide a nice improvement over the aforementioned DVD (even if it's likely that it came from the same master, the fact that the opening credits are still window boxed is a good indicator of this!). English language options are provided in DTS-HD 5.1 and 2.0 Stereo (which sounds like a down mix of the 5.1), the original Mono track has been left off of this release. Optional English subtitles are provided. 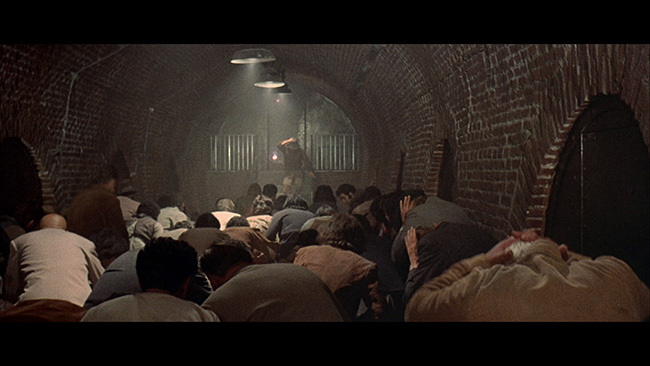 As to the 5.1 mix, the music in particular sounds excellent, with Morricone's trademark wails and guitar cues hitting from just the right angle in the soundstage to really heighten the action. The dialogue is clean and clear and there are no problems with hiss or distortion present throughout the mix at all. That's the good news. However, once again, MGM has tinkered with the gun shot sounds and they are noticeably different than those present in the original mix, which is bound to upset some purists (and understandably so). There's also brief instances of missing dialogue (some of the profanity is gone). This was an issue on the old MGM DVD and it's an issue on this Blu-ray from Kino, who really should have included the original mix. 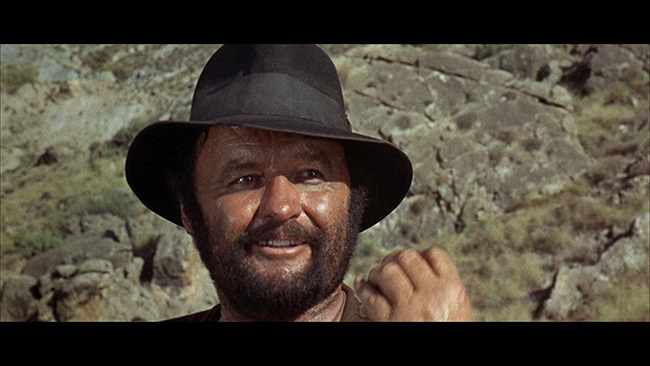 New to this Blu-ray release from Kino is an exclusive commentary track from filmmaker Alex Cox, who proves to be knowledgeable and fun to listen to when it comes to the subject of spaghetti westerns (it's well know that he's a big fan of the genre). 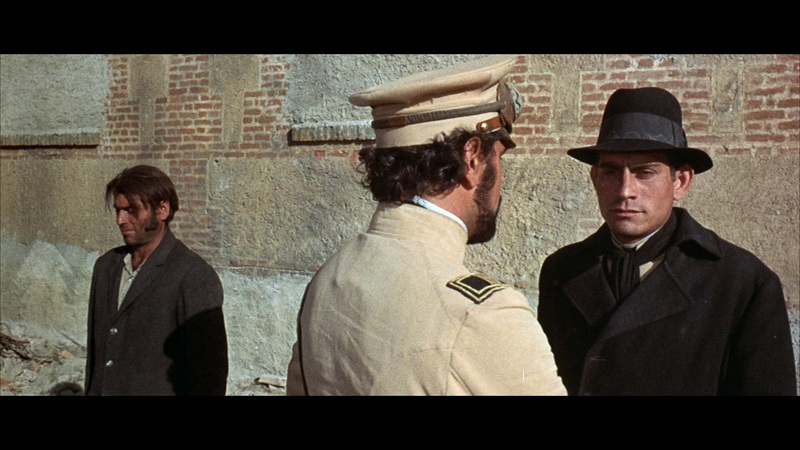 He offers up some political context for the film, provides his thoughts on what works and sometimes what doesn't, provides some welcome background information on the film's history, presents loads of information on the cast and crew and spends plenty of time talking up Leone and Morricone. The disc also includes an interesting and informative commentary track from Christopher Frayling (carried over from the previous special edition DVD release). The most interesting aspect of this track, to my mind at least, is the way that Frayling explains the difficulties behind the politics of the film, what with it being made under the guidance of some very left-wing filmmakers. Leone came under fire for some of the ideologies in the film, and oddly enough, Pier Paolo Passolini (director of Salo) stood by him while he was being dismissed by some of his colleagues. He makes some comparisons to the way that the world was when the film was set as well as some interesting notes about the state of Italian politics at the time the film was made, and he also delves into the back-story about Leone's meeting with Sam Peckinpah. 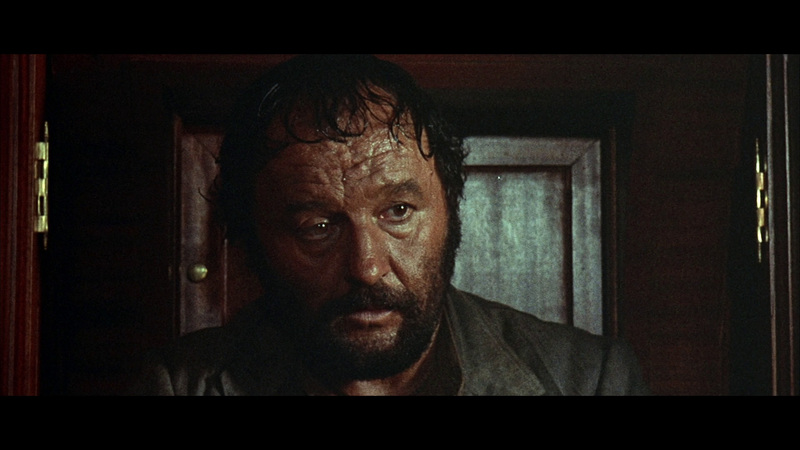 There are plenty of anecdotes about Leone's on set relationship with Rod Steiger (they didn't get along so well sometimes) as well as interesting details about sets, post production, and the like. The featurettes, all of which are from the aforementioned DVD, start off with a documentary entitled The Myth Of Revolution, that runs roughly twenty-one minutes. This is an interesting political dissection of the film, again by Christopher Frayling, who explains who Leone decided to make a film about a revolution and who makes some interesting comparisons to the Third Reich. 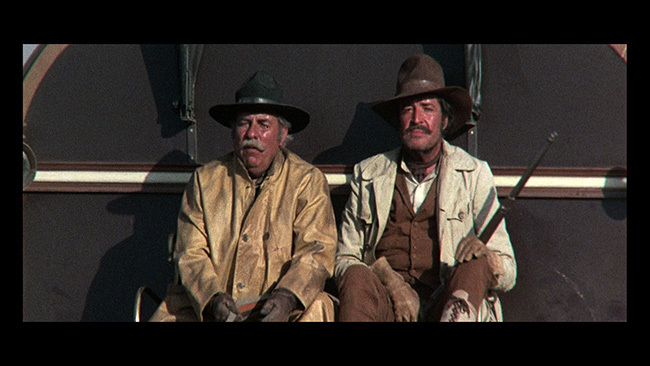 He also goes into more detail about some of the ‘castings that could have been' as he tells us about how Eli Wallach and Malcolm McDowall were both offered roles in the film. Sergio Donati Remembers Duck You Sucker! is a seven-minute discussion with, well, as the title says, Sergio Donati, the co-writer of the film. He talks about the history of the movie, how Leone didn't want to direct it initially and how Peter Bogdonavich was on and then off as well. There are some very interesting stories in here, and Donati is fun to listen to as he talks about Leone with nothing but obvious admiration. Sorting Out The Versions is an eleven-minute talk with Glenn Erickson (of DVD Savant fame) who does an excellent job of explaining the bizarre history of the various cuts and alternate versions of the film. Ultimately, he explains to us how the filmmakers finally settled on the version that is presented on this Blu-ray and why. He gives all sorts of detail on the restoration that took place, and the film clips that accompany him as he sorts it all out for us makes things easy to follow and understand. This is an exceptional extra feature and if I have one complaint about it, it's that it is too short as Erickson's history lesson is just that fascinating. A six-minute featurette called Once Upon A Time In Italy is a quick examination of a museum exhibit set to be unveiled in July of 2005 at the Autry Museum Of The American West in Los Angeles that takes a look at the cinema of Sergio Leone. Christopher Frayling plays museum tour guide here as she shows off the various pieces of memorabilia and whatnot that make up this exhibit. Rounding out the extra features are a six-minute restoration documentary, nine minutes' worth of location comparisons, six radio promo spots, a lengthy theatrical trailer, a Trailers From Hell bit with Brian Trenchard-Smith, two still galleries consisting of promotional art and some behind the scenes photographs. Kino also supplies bonus trailers for A Fistful Of Dollars, For A Few Dollars More, The Good, The Bad And The Ugly and Once Upon a Time In The West. Reversible cover sleeve art is also included. 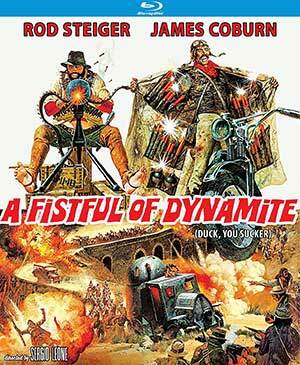 A Fistful Of Dynamite is a strong film, even if it will probably always live in the shadow of Leone's other westerns. The performances are enthusiastic and fun, the script is quite clever and the direction up to the master's typically high standards. Kino's Blu-ray ports over everything from the old MGM DVD and adds an interesting new commentary from Cox and a few other extras to the presentation but fails to fix the audio issues or improve on the master used for the transfer. Still, this is a film worth seeing and even if this release has some issues, it comes recommended on the strength of the movie and the extras. Great characters, great visuals, great score... Great movie.